Growing Success Advanced Slug Killer 575g provides rain-safe easy scatter blue organic pellets containing a naturally occurring active Ferric Phosphate ingredient. Suitable for use around edible and non-edible plants at 5g per square metre. Repeat treatments may be necessary to maintain control, to a maximum of 4 treatments per crop. Keep slugs and snails away the organic way and helps the thriving wildlife population in your garden. 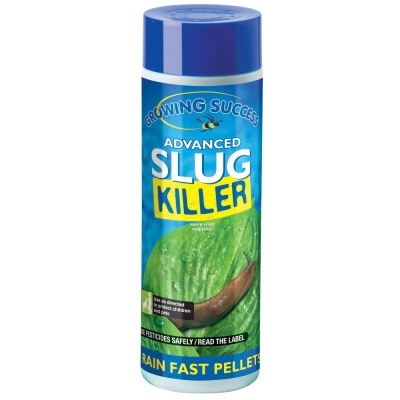 Slugs and snails eat the pellets and move away from your plants, ceasing to feed. On moist soil or in humid conditions granules take up water and begin to swell. Slugs prefer moist and soaked granules. Once attracted to and consuming the bait, slugs cease to feed and crawl into the ground or a secluded location to die, leaving no unsightly trace of slime secretion and no necessity to collect corpses. Caution: Unsafe to children and pets.